“In winter the bare trees are black against the snow and sky in the Old Burying Ground on Pleasant Street. Like frosting, snow decorates the gravestones of our town’s early families. The Bryants, the Bucknams, the Gerrys, the Greens, the Goulds, the Hays—our founders. 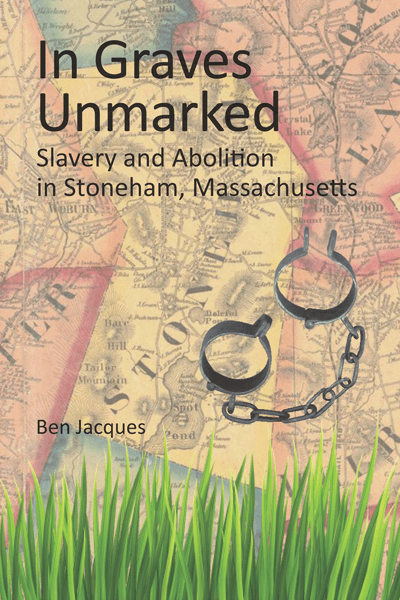 So begins the untold story of slavery and abolition in a town of farmers and shoemakers just north of Boston. Once part of Charlestown, the village was incorporated in 1725 as Stoneham, Massachusetts. In this little book you will learn the names of men, women and children who occupied the lowest rung in colonial society. As slaves, they tilled the soil, split the wood, cooked the food and, in some cases, fought in our wars.